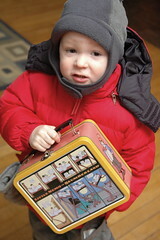 snowdeal.org > ex machina: the eric update - day 919: odin's first day of preschool! the eric update - day 919: odin's first day of preschool! i have to admit that i thought the day that odin would be rushing past me barely interested in showing me his new lunchbox and brimming with excitement at the prospect of going to preschool was somewhere off in the distant future. but time marches on and after giving the decision much deliberation, today was that day. odin is quite the inquisitive and sociable little boy and we've been increasingly confident that he could really shine in an program with an emphasis on learning and development and it just so happens that there is a highly recommended preschool less than a half mile away so we somewhat hesitantly enrolled him to go two days a week. of course we had all the usual fears. would he miss us? would he share with others? would he quickly find friends to play with? he didn't seem to notice one whit that today was the first day that he would be out and about in The World without the guiding hand of his mamma or poppi. no, there was no sadness or sorrowness or lamenting or tantrums. and by all accounts, including his own, he had a Fantastically Fun Time full of new adventures and friends and games. of course, it's certainly a mixed bag of emotions for us - proudness and sadness all rolled up together.